Maximum Occupancy in house is 6 people. 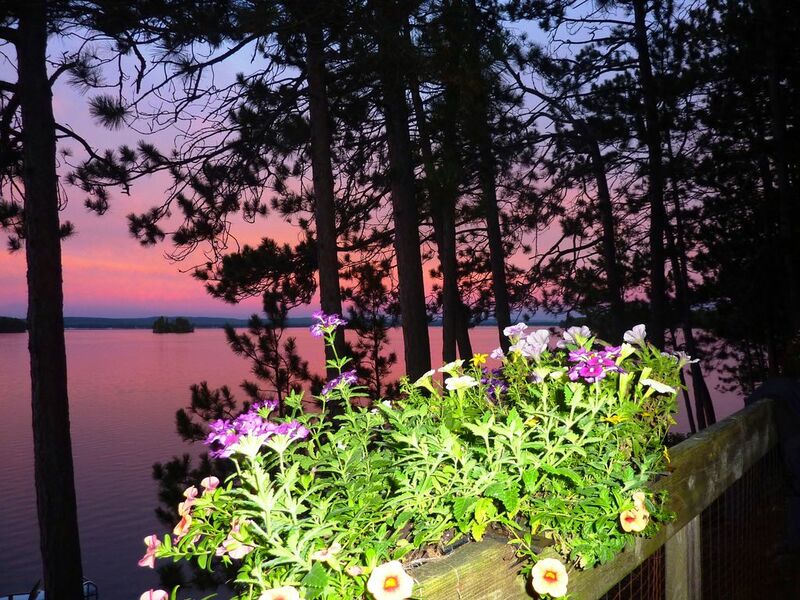 This Ottawa Valley Cottage rental has spectacular views from the deck overlooking 420 ft lake front, on Round Lake. (note that google maps shows we are on Bonnechere River: this is not correct we are on the lake) The property is wooded with red pine, white pine and poplar. The cottage is very private you do not see your neighbors on either side. With southwest exposure you have sun all day long and great sunsets. The cottage has one master bedroom with half bath and a King size bed. A second bedroom with a bunkbed. A third bedroom with a Queen size bed. A breezeway room relaxing with a couch and entertainment unit. A basement family room/bedroom with a futon couch and entertainment area. The cottage is well stocked with games, toys and movies for all ages. A large deck with table and 8 chairs, 2 lounge chairs and access to the lake front. The lake access has stone and wooden steps leading to a large swim dock with a swim ladder. The shoreline is rocky but the lake is hard sand with scattered rocks. Visiblity is very high and no weeds. A firepit is located by the edge of the lake for you enjoyment. We have a canoe with life jackets and paddles available for rental at a rate of $ 75.00 per week. Round Lake is three miles by seven miles wide and around 90 feet deep. Water visibility is high, as the lake is fed from springs from adjacent Algonquin Park. One of the finest fishing lakes in The Ottawa Valley and by most standards the largest and most popular lake in a 60 mile radius. Round Lake was stocked with lake trout in the fall of 2012. Killaloe is the nearest town, eight miles away, and provides a bank, LCBO, grocery store, restaurant and chip stand. You are about 3000 feet from Foy Provincial Park which has the nicest sand beach on the lake. It is no charge to enter the park and use the beach and hiking trails, as no camping or overnight is allowed. Wolf Ridge Golf Course is a 18 hole course within a 15 minute drive from the Cottage. The list of things to do in the area is, frankly, amazing. There is a place where you can get away, but still absorb the Canadian experience. If you are looking for a place to get away with the family or your significant other, your senses will be satisfied. Please email me if you have any questions or require additional photos. House Rules: We only book by the week from June 30th thru Sept 1st. We really loved spending a long weekend here in October. The cottage is cozy and comfortable with a beautiful kitchen and several nice living spaces with couches, tv, etc. The bedrooms and bathrooms are also great. Absolutely no complaints about the property whatsoever! It's also in a stunning location on the lake and although it was already too chilly to get out and swim, I can imagine it's amazing in the summer. We found plenty to do as it's not far from various hiking trails, cute little towns, and various attractions such as Bonnechere caves. We highly recommend this cottage and would love to come back again with our family of 4. Lastly, the owner was very responsive and friendly. All in all, a wonderful stay! The website advertises, “Enjoy peace and quiet”, and that is exactly what we did!! We arrived in the rain after dark on a moonless night. We were tired so we went straight to bed. When we woke up in the morning, we were amazed by the beauty that surrounded us! The cottage was beautiful, well supplied with everything we needed to prepare meals and the appliances were state of the art. We enjoyed a fire in the wood burning fireplace every morning and evening. We were only a short drive from the small town of Killaloe which had anything we needed. But even better, we were only a short drive from the east gate to Algonquin Provincial Park. We went on a number of hikes there and found the park to be lovely and pristine. We took a canoe with us, but found one there that we could use as well. Our hosts made us feel very welcome and when we had questions they were very quick to get back to us and answer our questions. The best recommendation I can give, is that we hope to stay there again sometime soon! Second year at this wonderful cottage. Very tranquil and relaxing atmosphere. All the amenities of home while situated in Gods' country. I had the pleasure of meeting Mike at the property on his departure day. Mike's motto is " leave it better than you found it". We had a nice conversation while he was planning his trip and great dialogue as he was about to depart. Mike was very thorough in cleaning and leaving our lake home in fantastic shape. You will have no worries about your property if you rent to Mike. I hope our paths cross again in the near future. We thoroughly enjoyed our stay over the weekend. Spectacular views and absolute tranquility. I would definitely recommend this spot for anyone! I’m delighted you enjoyed your time at our cottage. Thanks for sharing your experience and your kind words! Beautiful Place - Great Stay! I've been visiting Stew and Paula's place for a few years. It's becoming a bit of a tradition. Will definitely be visiting again next year. Always a great time! Everything you need is pretty much there. Can't say enough great things. Cottage was great - beautifully furnished and decorated, well stocked kitchen and new appliances. Very peaceful setting - almost like you have your own private lake. Kids enjoyed fishing off the dock, great fires by the lake and enjoyed the kayak. Have never been in this area - it is beautiful and we made use of Algonquin park and a Rafting trip before we went to Ottawa for the weekend. Thanks to the Gavin family for sharing their home with us.